I'd like to open discussion regarding the e-jacket based on the above post that was made in another thread. I have seen the stress a glider goes in when placed into an e-collar. It will break your heart and you will want to remove it ~ however, when you weigh the risks of them not having it on, you leave it. The glider will succumb to the e-collar, some quicker than others. They have to adjust to eat and drink, and we sometimes even have to alter the way we feed to make things easier on them. However, this is all worth it to save their lives and/or prevent further injury to themselves. I have an excellent video that I wish I could get onto my computer of a glider being put into an e-collar, the fight, them getting out of it, and having to do it all over again. Someday, I'll get it on the computer! And, what types of injuries would you use and NOT use the E-Jacket? Pro's & Con's of using one over the other? Why is it less stressful? What are the gliders reactions (or lack thereof) to the e-jacket? Hope to see the video! ETA: Sent Denise a PM to alert her to this post. Last edited by GliderNursery; 08/04/11 10:08 PM. AFTER Boomerang had his little hissy fit, we realized we should have video taped it. After the SGGA, I am a convert to the ejacket. I have ecollars, and will continue to use them as necessary. However, Boomerang was not really a candidate for an ecollar. His neck is bigger around than his head! He would have popped an ecollar right off! The stress he went through putting the ejacket on was actually pretty minimal. He was angry at Denise. He danced around the bed for a few minutes. Then he got over it. I've seen the same process that gliders go through in an ecollar. This was actually over significantly quicker. Once the jacket was on - there was really nothing for him to fight against. It isn't in his line of sight, and he isn't really able to grasp it. So - once it was on, the fight was over. I've seen gliders hang upside down and fight an ecollar for up to an hour. The whole "I don't like this! Take it off!" process with Boomerang lasted about 5-10 minutes. And part of that was while Denise was calmly cutting his nails. I've taken the jacket off and put it back on several times now. It takes me a few seconds to get it on snuggly. Now, I know that there are those who can pop ecollars on that quickly. I'm not one of those. I really struggle to get ecollars on right. Not so the jacket. To me the biggest thing is - I'm very concerned about Boomerang's eating and drinking. The pain meds were knocking him out 24/7 and he stopped eating and drinking. When I stopped his pain meds, he was able to eat and drink right away. No "learning curve" was required, and no special feeders or waterers. 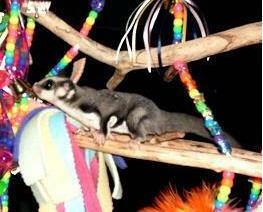 Thankfully I have never had to put an e-collar on a sugar glider. I have them on hand and I also have three different sizes of e-jackets on hand. I have put Gizmo in an e-jacket as a demo for the e-jacket. She wasn't happy about it but she didn't roll around trying to get it off. At the SGGA Denise put my biggest glider,Tank, in her largest e-jacket to see if it would fit him before I purchased it. He was one mad little animal, he latched onto Denise and held on for several minutes. Sorry Denise. He didn't roll around either, but she sure whipped his tail around like a cat does when they are mad. I think there was steam coming out of his little ears. He would scoot backwards but there was no thrashing around like you see when they are in an e-collar. Gizmo can't be a good example of how a glider reacts as after putting her in an e-jacket for 3 or 4 demos and her wearing it for at least 5 minutes I have come to the conclusion that the kids in the family from where she came to me from must have played dress up with her. I think that both e-collars and e-jackets have a place in everyone's first aid kits. I can tell you Shadow doesnt like anything around his throat or neck... he doesnt even like to be petted near his throat. He literally had a heart attack when we forced him into a e-collar. I also tried using an e-collar on another male I had neutered he struggled to the point he rubbed himself raw where it went around his neck. Here are a couple of videos. Both gliders had just woken up from neutering. Before Denise's miracle invention of the e-jacket, putting my one glider into an ecollar was extremely hard on him. He would literally hold his breath, and go into seizures. As as result, I had to sit with him 24/7 for almost two weeks. I called Denise when she first came up with the idea, she immediately sent one to me. Putting it on was a little difficult, but once on, Choco adjusted to it within 10 minutes. He didn't fight, he was more frustrated with the 'feeling' of confinement. Great videos Connie. The one in the ejacket didn't seem to be fighting the jacket as much as he was fighting waking up from the anesthesia. Once awake, he didn't seem to be fighting it at all. I have to ask...what is the fluid filled glove for? Is it warm to help them warm up from the anesthesia? Who do I contact for an e-jacket? My girls are still growing, but I would rather go ahead and get one, and get another size later just in case. Contact Denise: minkasmom. she is the creator of the e-jacket. So far I've only had one glider of mine that has had to go into an e-collar/jacket and that was Ryan. This sweet little guy only fought his collar for a few minutes before he accepted it. Even tho he didn't fight it, he was never content while wearing it because it was too restrictive and didn't really allow him to get near his buddy Brodie. The only way he could reach his buddy was to bulldoze him into a corner and trap him in the cone with him. Once we got the Jacket he tried to briefly wiggle out of, but once we got it fitted properly on him, he was sooooooooo much happier because he could move and eat and even have limited grooming capabilities. It was so much more comfortable for him. Thank you so much Denise for creating this. It has made an incredible difference to a great number of gliders. It's warm water to help keep them warm. It's something she's always done I guess. As you can see, once they wake up, there's no keeping them on it. I finally gave up and put him in my bra. Once he was there, he went right to sleep. He wasn't bothered at all by the ejacket again, after the initial hissy fit. Sorry I'm just NOW seeing and giving my input on this whole thread...on top of EVERYTHING else, I've been away because of an issue that arose with my dad: He called me yesterday to say that he'd had "complications" from a minor surgery & I've been a bit pre-occupied with him! This is also the reason why I've been silent all week....just trying to catch my breath! PLEASE!!!! The first time was because of a mating wound that Minka had late last year. I put on a small bandage, VetWrap, then the e-jacket...for the sake of keeping her toenails away from the OTHER stuff. It worked WONDERFULLY. The second (and more recent) was because of a cloaca/tail issue that Amos had...the cloaca was swollen from whatever (vet couldn't pinpoint it) & it created an issue with blood circulation to the tail (end result was a partial amputation). He had to wear it for 2 weeks until I was satisfied that both areas were healing adequately. We've all been watching how Simba has progressed with HIM wearing the e-jacket (got an update Wednesday that had me in tears of JOY...he is OUT of the e-jacket more than IN it, still has to wear it occasionally but that's much better than ALWAYS). Then there's the perpetual good news about "my adopted baby boy" Spencer... ...my little guinea pig and the FIRST to really TAKE the e-jacket around the block a few times to see how it works, then adjust a little here & there. I am in 110% agreement with what you said at the beginning, Shelly: Price is NOT an issue if it (a) is more comfortable for a glider; and (b) helps stop FURTHER DAMAGE. What other things could be more appropriate for an e-jacket vs. an e-collar? I don't know.....getting them "out there" and "tried out" for this problem or that will be the only way that the possible uses can be listed. But mating/dominence wounds CAN be added...when combined with OTHER bandages I'll include. Connie, I didn't take time to watch your video...time is limited for me right now...but I thank you for making it & posting it here! I have one also, but became really frustrated trying to get it OFF my camera and INTO my computer! Feather, I consider what Tank did to me "part of the whole scheme of things"...I hear Bourbon's voice about RESPECTING THE TEETH! Words I've always taken seriously....just needed a little reinforcement I guess! Alden, I'm just GRATEFUL that Boomerang's problem happened when it did (if it had to happen AT ALL)...while we were all together & you had the STRONGEST support crew around you that anyone could EVER ask for! Chris..... need I say anything else? Nope. Where would I go to purchase an E-jacket from you? Do you have the e-collars too? Sorry I've been pretty scarce around GC the past few days...I've had my hands full with dad's health (minor) and cleaning out/redesigning a cage. All you need to do is send me a PM that has info about how big around your glider is (there are 3 sizes to choose from, and size DOES matter). I have a handful of back-orders to catch up with, but I've got the pieces cut out & ready to sew. I don't have a website to order from...I barely have enough time to do everything that needs to be done, let alone taking care of one of THEM too! Just send me your info...and I'll add you to "the list".